The throwaway society has reached new heights, albeit 'greener' ones, with a new art installation in Belfast. The University of Ulster has unveiled an art-science project that aims to help "reverse the wastefulness" of the disposable world in the Ormeau Baths Gallery. Dresses made from dissolving textiles created by the Fabric Forward team at the UoU's Interface research and design centre will be hung from scaffolds. They are then gradually lowered into giant goldfish bowls of water in which they dissolve slowly over three weeks, creating vibrant underwater fireworks. Dissolving bottles which melt in hot water to form a gel in which flower seeds can be grown are also part of the Wonderland exhibition. The action of the exhibits is generated by science-based recycling processes, two of the processes are already being patented. Leading research chemist, Professor Tony Ryan of Sheffield University, said they wanted to make people think about what they were wasting. "People throw away 20 tons of plastics waste in their life. Hopefully, Wonderland will make us think about what we are doing to the earth," he said. 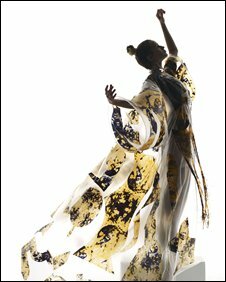 The exhibition-installation is a joint project with UK designer Professor Helen Storey of the London College of Fashion. Organisers said that the exhibits were a "firmly-rooted research-based effort to focus people's minds not just on waste but on why and how we should recycle it" and was what "happens when fashion and design meet chemistry and nanotechnology". Interface's Trish Belford said the aim was to "bring wisdom and flair to an everyday problem for mankind". "Aesthetically and scientifically, it is raising awareness about real worries of the world," she said.